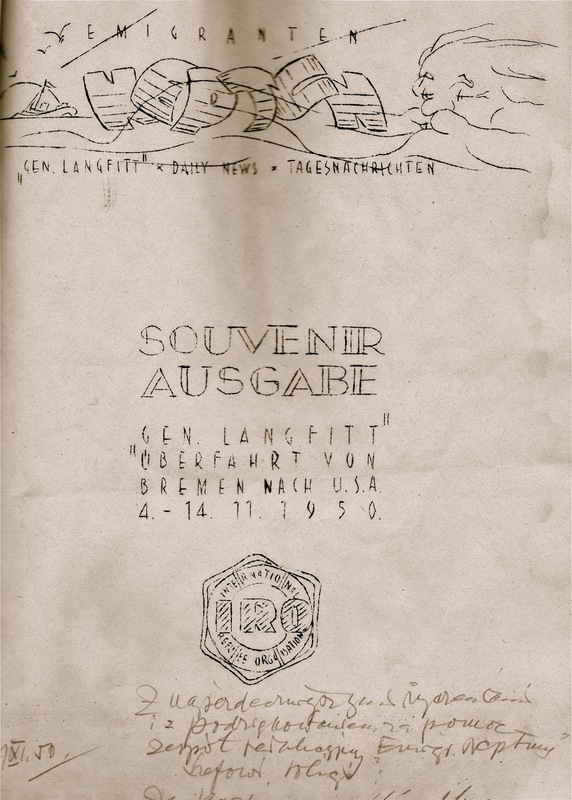 On November 4, 1950, the former troopship, General W.C. Langfitt, sailed from the port of Bremerhaven, heading into the North Sea. 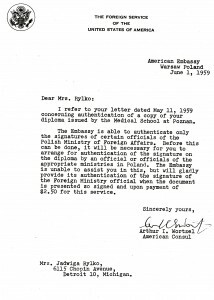 Ten days later it arrived in New York City, marking what Jadzia would always refer to as “the beginning of a new book—a different life.” My parents settled in Detroit, Michigan, among friends and a large Polish-American community. 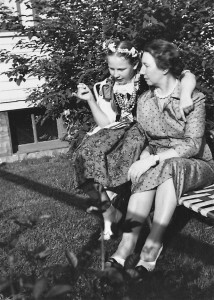 The early immigrant years were difficult, characterized by my father’s struggles to find employment and my mother’s unsuccessful efforts to gain medical licensure in the U.S. By the early 1960s, their hard work and frugality brought our family into the middle class—a new home, new car, and a memorable trip back to Poland in 1967. 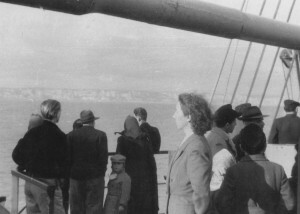 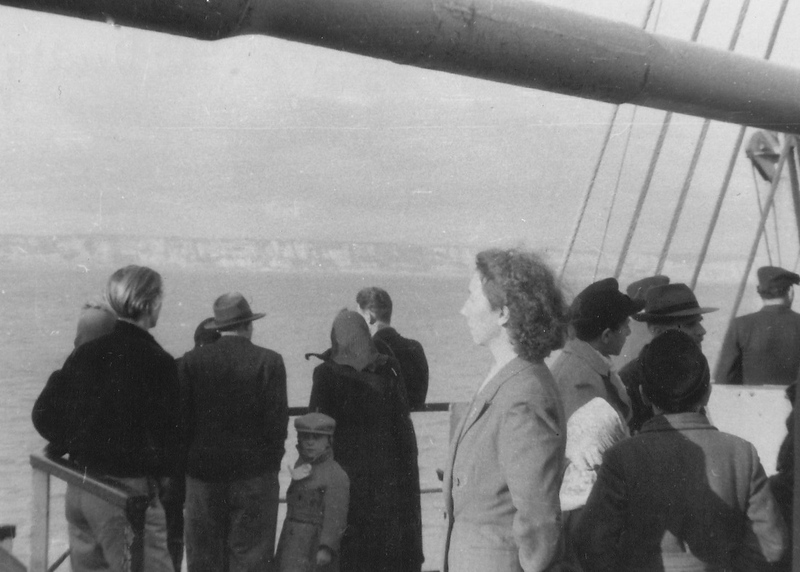 (285-286) Jadzia on the Langfitt, as the ship departs for the trip to the United States (November, 1950). 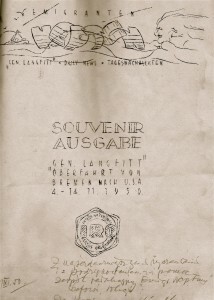 (287-288) The souvenir issue of the ship’s newsletter, Emigranten Neptun (November 13, 1950). 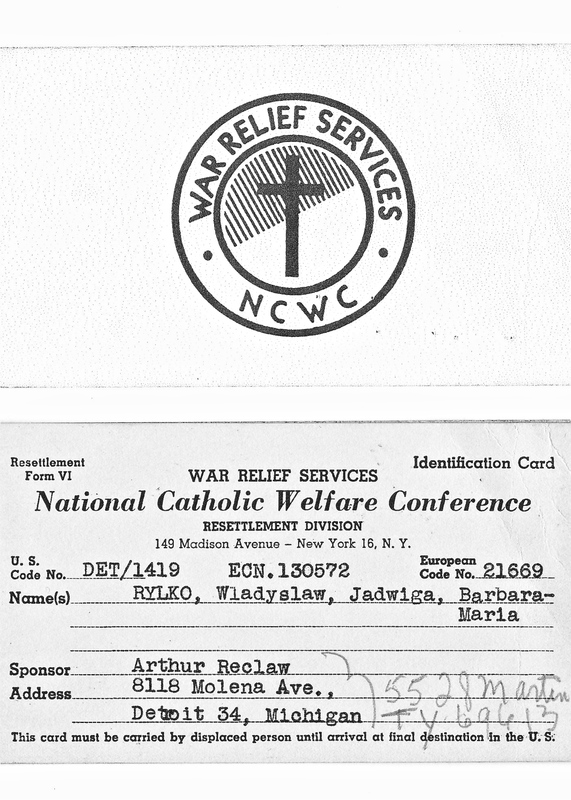 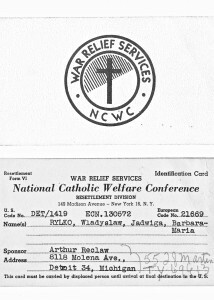 (289-290) The resettlement ID card issued by the War Relief Service, listing the name and address of our immigration sponsor. 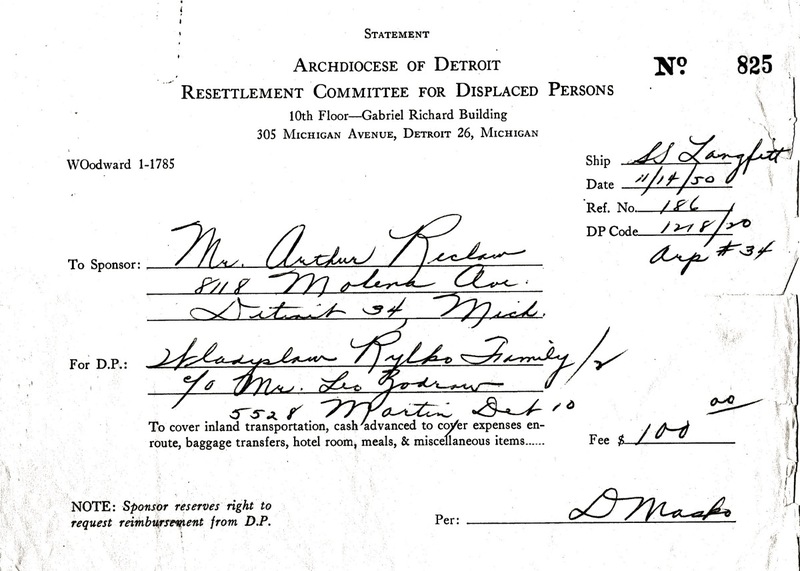 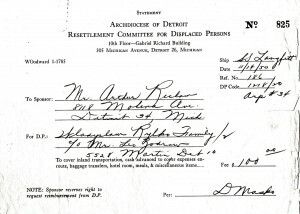 (289) The cost of our resettlement once we arrived in the United States—$100—was finally repaid to the Catholic Archdiocese of Detroit by my parents in 1954. 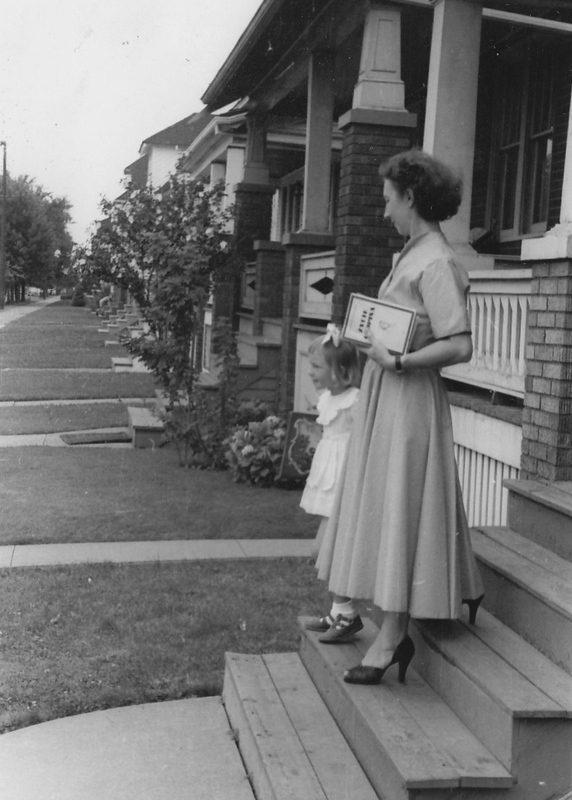 (295-296) Our first house on Chopin Street. My mother is holding a Polish biography of Frederic Chopin in her hand (Detroit, 1955). 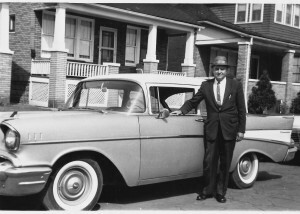 (297) Fulfilling a part of the American dream: my father with his new ’57 Chevy. 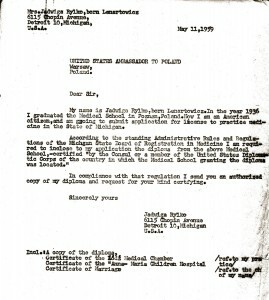 (313-314) Much of our early life in Detroit revolved around Polish-American activities. 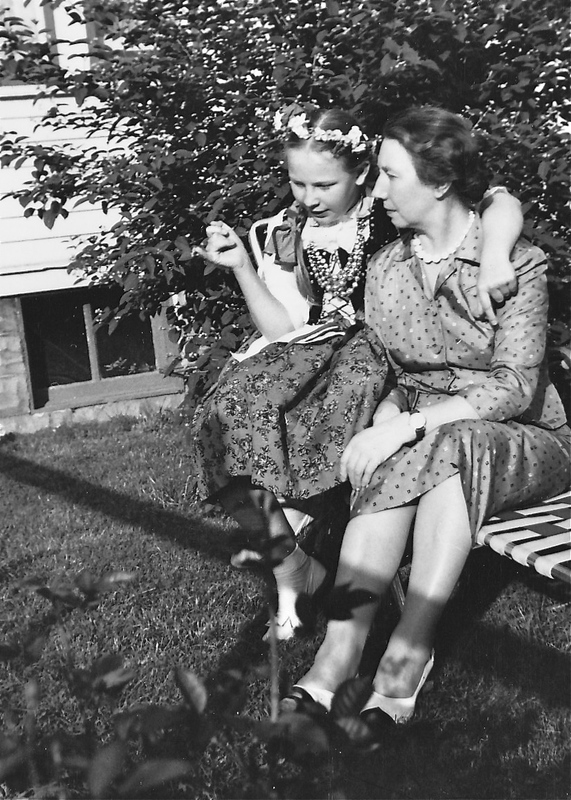 Sitting with my mother in our backyard, after a Polish folk dance performance (1959). 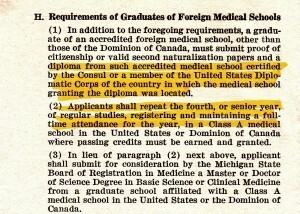 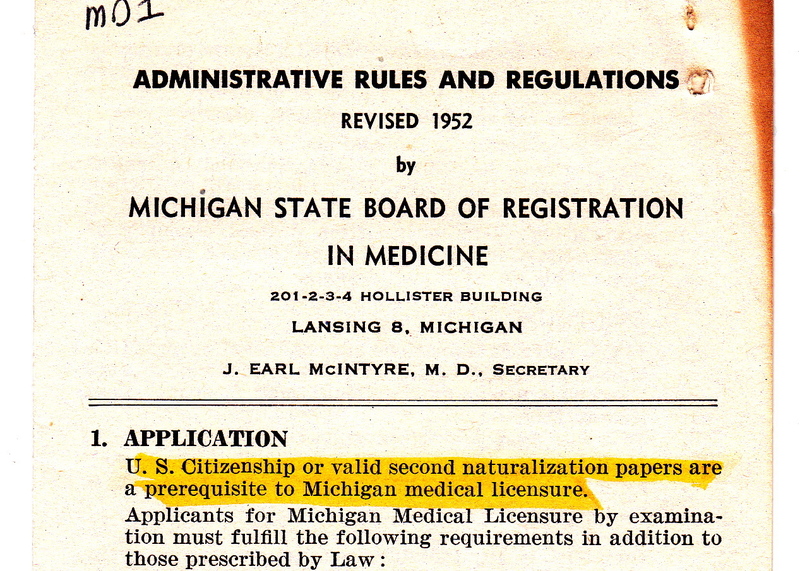 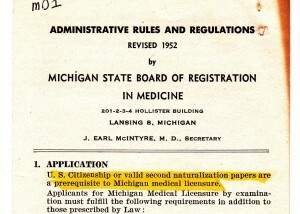 (302-303) Excerpts from a brochure on State of Michigan licensing requirements for foreign physicians in 1950. 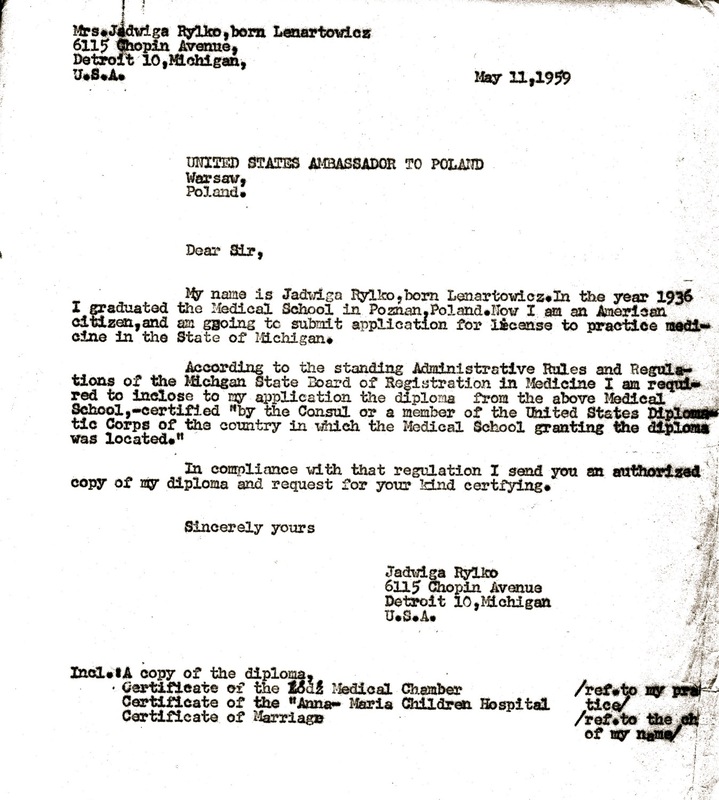 From Jadzia’s file, archived by Władziu, documenting her efforts to obtain medical licensure. 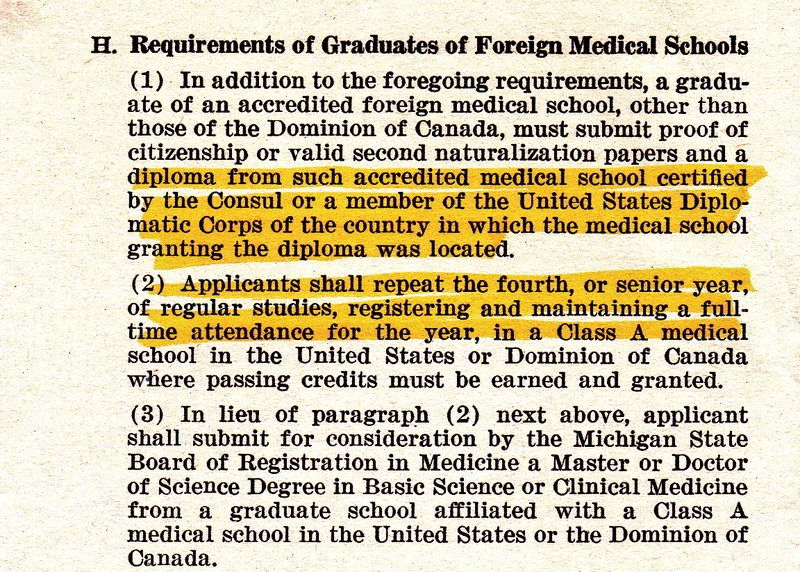 Note the requirement that the Consul or member of the U.S. diplomatic corps in Poland certify her medical diploma. 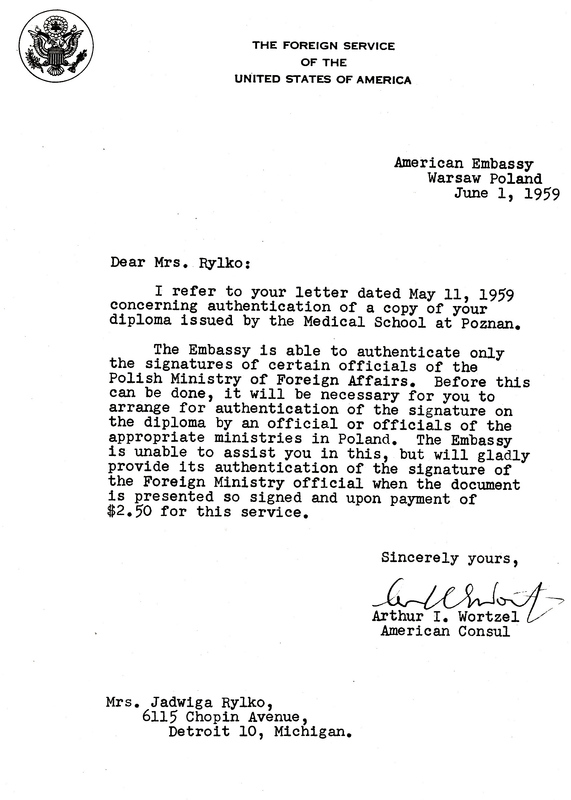 (306) Letter received from the American Embassy in Warsaw, stating that they were unable to fulfill her request (June 1, 1959). 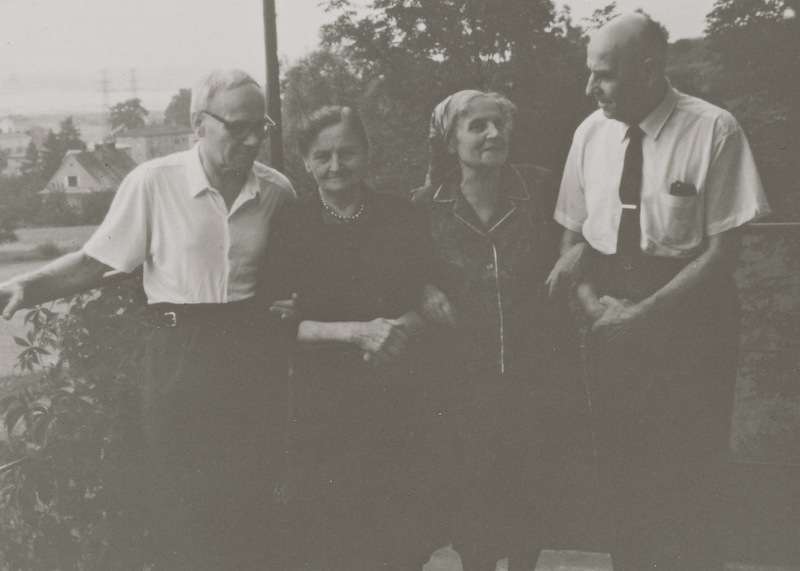 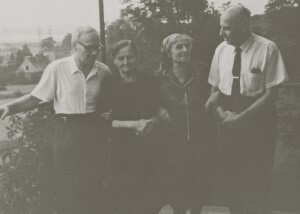 (316) Władziu (far right) with brother Józek and sisters Paulina and Bronia during our 1967 visit to Poland—28 years since he last saw them. (316) My parents and I during our 1967 trip to Poland. 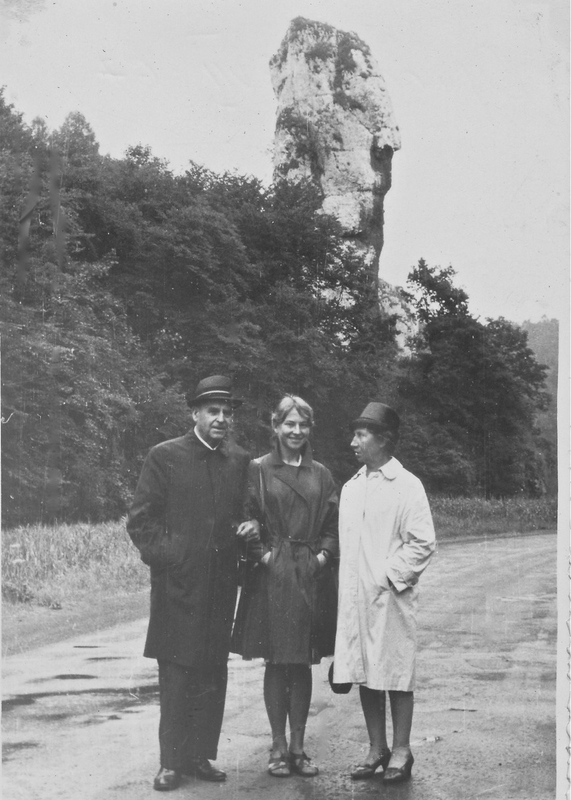 Taken in Ojców National Park, just north of Kraków, known for its caves and rock formations, such as Hercules’ Club seen in the background.